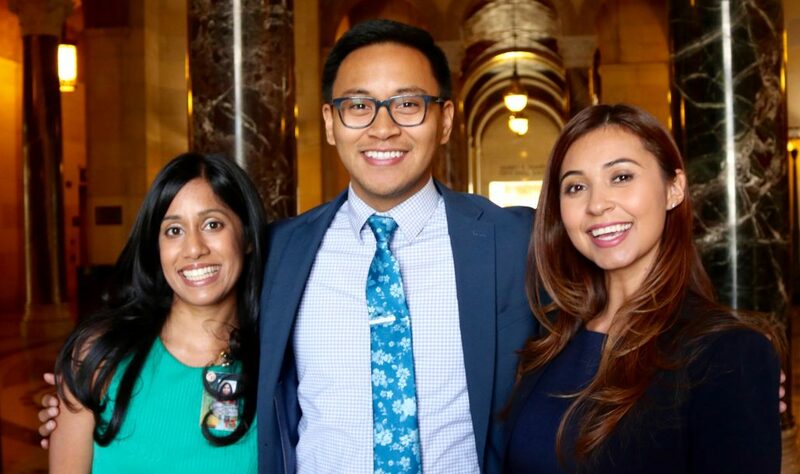 It would be easy to mistake Tammy Barreras, Jayanthi Daniel and JC De Vera for any of the hundreds of staffers who hustle through the hallways of L.A.’s historic City Hall each day. The three carry official city badges, they each work in the mayor’s office and their days are packed with memos, deadlines, proposals, city events and projects — all geared at improving the lives of Angelenos. But when this trio clocks out, they each take on a role that’s unmatched by other city employees: full-time graduate student. 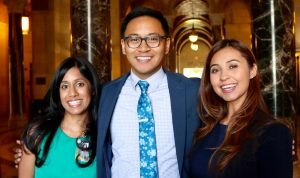 Together, the three make up the 2016-2017 cohort of the David Bohnett Fellowship Program at the UCLA Luskin School of Public Affairs. 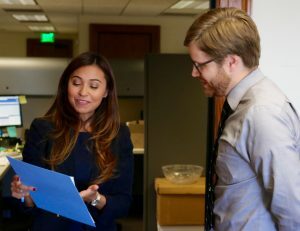 It’s a unique opportunity for graduate students to work closely with Mayor Eric Garcetti’s staff while completing their master’s degrees at UCLA. 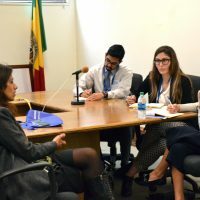 The fellowship program, which accepts applications from UCLA Luskin students in all three of the school’s disciplines, consists of one summer of full-time work in the mayor’s office, followed by a yearlong, part-time position at City Hall during the fellows’ second year of coursework at Luskin. UCLA has offered the fellowship for students in the School of Public Affairs since its inception in 2007. Luskin students may apply in the spring of their first year for placement during the summer between the two years of the program. Each fellow works in a different department within the mayor’s office. Tammy Barreras, a student in the Master of Social Welfare (MSW) program at Luskin, works in Garcetti’s Budget and Innovation Department and focuses her work in the Innovation and Performance Management Unit. Barreras grew up in the San Gabriel Valley community of La Puente. She previously worked as an inpatient pharmacy technician in Orange County before pursuing her undergraduate work at Cal State Los Angeles. She had plans to become a pharmacist before shifting her focus to social work after realizing her true passion was helping those in need. 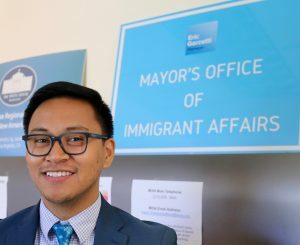 JC De Vera, pursuing his Master of Public Policy (MPP), works in the mayor’s Office of Immigrant Affairs. Much of his work involves legislative advocacy and community outreach programs. One of De Vera’s first projects during the fellowship was helping organize a press conference in which the mayor announced the launch of a voter registration campaign geared for Spanish-speaking Angelenos. Jayanthi Daniel, also an MSW candidate, conducts her fellowship work in the office of Ana Guerrero, the mayor’s Chief of Staff. It’s a rare appointment — only one other fellow in the program’s history has had a chance to work in such an important office. Her work largely involves research, hands-on team assistance and event execution. Due to the broad nature of the work for the mayor’s chief aide, Daniel finds herself working on a variety of projects and programs. 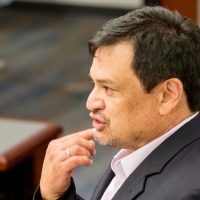 Daniel, a former journalist, works closely with Guerrero, the city’s first Latina chief of staff and one of the highest-ranking Latina city officials. “Not only is it an honor to work with a chief of staff, I’m working with a groundbreaking, trailblazing chief of staff — somebody I learn from every single day,” Daniel said. The fellowship satisfies the internship requirement for the Public Policy curriculum and the fieldwork requirement for Social Welfare master’s students. Because the fellows are also full-time students, there is often overlap between what is discussed in the classroom and at City Hall. 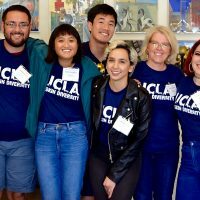 The David Bohnett Foundation has been funding the program for UCLA students for the past 10 years, and now supports similar programs for graduate students at the University of Michigan and New York University. This fellowship was born out of a conversation at a dinner party hosted by David Bohnett, the foundation’s chair. Bohnett found himself in conversation with former Los Angeles Deputy Mayor Torie Osborn, former Luskin School Dean Barbara Nelson and Luskin lecturer Michael Dukakis. The four had been discussing opportunities for students to work in local government when the idea to place Luskin students in City Hall first arose. 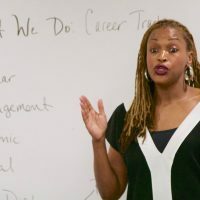 Powe explained that the Bohnett Fellowship is also a means to advance one of the Luskin School’s major goals for its students. They work in different offices within City Hall, but the three current fellows say they do run into each other frequently and have attended each other’s programs and events. Additionally, nearly a dozen Bohnett fellowship and UCLA Luskin alumni now work full time in city government. Alumna Kiana Taheri MPP ’16 was a Bohnett fellow in the immediate past cohort and now works full time in the Innovation and Performance Management Unit (iMPU) — the same department where she worked as a fellow — doing similar work to Barrera’s current post. She found that her coursework for the MPP degree and her fellowship work had tremendous overlap. At UCLA, Taheri said, she had been interested in improving government efficiency and utilization of innovative solutions. The Bohnett fellowship provided a chance to do that. Dan Caroselli, director of the iMPU, supervises both Barreras and Taheri. Caroselli, who is an alumnus of UCLA Luskin’s Urban Planning program and another former Bohnett Fellow, said the program has been very successful in bringing “motivated and capable” students into city government. For the past five years, Bohnett Fellows from the three campuses have attended the United States Conference of Mayors in Washington, D.C. The conference brings together civic leaders from over 1,400 U.S. cities to build partnerships, work on policies and discuss successes and best practices. This year’s Winter Meeting of the Conference will be held Jan. 17-19. Barreras said she hadn’t yet seen the agendas for this year’s Winter Meeting of the Conference, but is looking forward to learning from leaders in diverse cities and seeing the City of Los Angeles as a leader among its peers.